A city covered with sandy beaches and bookended by mountains, Cape Town is known as the most beautiful city in South Africa. Speckled with diverse culture & one of the world’s most riveting histories, my week in South Africa was the perfect combination of everything I hoped and nothing I expected. Flying from New York and arriving just after noon, day one consisted of pushing through the jet lag to make the most out of our three short days in Cape Town. Tackling Table Mountain first and gazing down from the 3,500 foot peak, the stretches of Cape Town’s coast quickly made us realize how saturated the city really was in things to do, see, and taste. Cable carring back down after a hundred panoramas and a glance at the souvenirs, the rest of our first afternoon in South Africa was spent strolling along the V & A Waterfront, gazing across to Robben Island, and finally finishing our never-ending, jet lagged day with dinner at Baía in Victoria’s Warf. Dreaming of shark cage diving from the first premiere of Shark Week, day two was spent crossing off another item on my never-ending bucket list (or at least trying). Waking up at 3am and journeying two and a half hours to Gansbaai, the Mecca of sharks & crazy people who like to swim with them, the half day shark cage diving excursion is definitely not for everyone, but it was for me! Unfortunately, as steadfast as I was to face my biggest fear, the day only stacked up to 3 hours of anticipation, a boat load of freezing, seasick people, and not a single shark to be seen. Grabbing our vouchers and trekking the two and half hours back to Cape Town, we quickly changed and headed to Boulder’s Beach in hopes that the penguins would cheer us up. And oh they did! While I knew Boulder’s Beach was known for the hundreds of African penguins waddling around and posing for photographs, it was completely different to experience first hand. Navigating myself first through the dozens of vendors selling everything from African masks to turquoise jewelry to dashikis and more, we then explored the ‘penguin beach,’ spotting dozens of penguins overwhelming the sea, sand, and boardwalk with their penguin pups in stow. Allowed to view from the deck or hike around to the beach access area, Boulders is an absolute must (but keep your distance or get jabbed with a razor sharp beak). Ending the day with a tasting dinner at a local restaurant called La Mouette, day two ended with delicious food and the determination to revisit the sharks again tomorrow! Committed to crossing off #2 on my bucket list (only following a camel around the Pyramids of Giza), I hiked back down to Gansbaai at the crack of dawn, determined to meet Jaws before leaving Cape Town. Telling everyone I talked to that I was going to a see a shark that day, we boated out to the shark waters & after only fifteen minutes of chumming the water, a ten foot great white whipped out of the water just feet away from the boat! As the boat hands yelled in broken English to hop in the cage, I plunged into the 40 degree water and as they closed the lid, the waiting game began. Thinking that shark cage diving would be easier on day two, as I waited over 50 minutes in the cage, numb from the cold and no sharks in sight (again), I started wondering if this whole shark diving thing was a hoax. 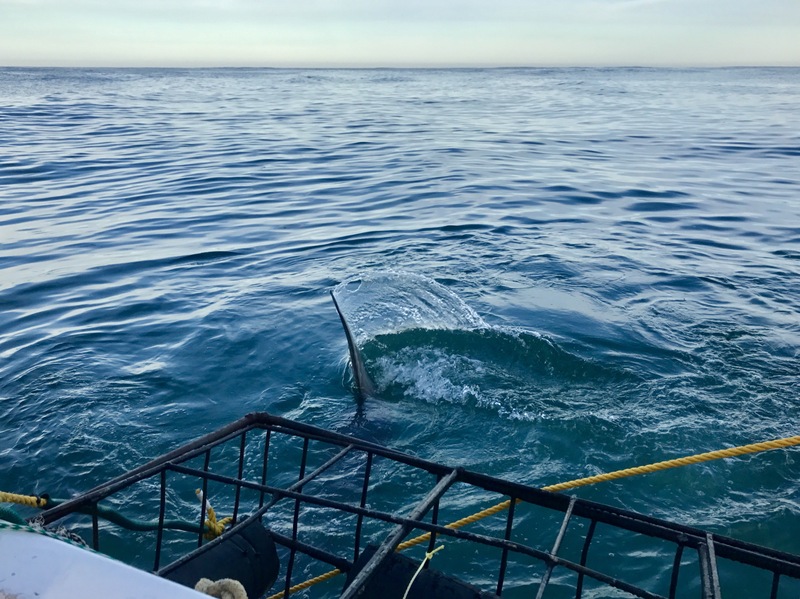 No sooner had I regretted coming back to Gansbaai though did a new shark appear from the midst and began circling the cage. By the end of the excursion I had seen three great whites, had a minor panic attack, but most importantly, had finally gone shark cage diving in Cape Town (successfully). Rushing back for a wine tour through Stellenbosch, our last afternoon in Cape Town was spent visiting vineyards, taste testing fresh cheeses and meats, and exploring the many wines of South Africa. From Pinotage, a signature South African blend of Pinot noir and Cinsaut, to Floreal, the wine chosen to be served for Nelson Mandela’s 90th birthday at Buckingham Palace, we sampled the best that Stellenbosch had to offer before returning to Cape Town for a night of drumming, dancing, and African cuisine at Gold Restaurant. Highlighting a 15 course tasting menu of cuisine from around the continent, we tasted everything from seswaa masala to ostrich samoosas to mchicha wa’nazi! And, if that’s not enough, while your senses explode, dancers, musicians & singers perform throughout the restaurant, chanting traditional tribal hymns & involving the audience in the performance the entire night. Sad to leave Cape Town, I had no idea what lay ahead of me as we drove two hours north to the the Aquila Private Game Reserve. Knowing the itinerary included two safaris a day, I signed my waiver to enter the property and we drove through the gates into Aquila. Or rather, heaven. With champagne on arrival and a glass-walled cabin on the edge of the reserve, there aren’t enough words to describe how incredible Aquila truly is. Upon arrival we dined at the poolside restaurant and sipped on our magically refilling champagne glasses, before grabbing our safari hats and jumping in for the two hour safari ride through the reserve. Spotting first hippos, elephants, and zebras, we continued on to the gated and locked lions den to meet the real life Mufasa & Nala. Venturing through a pasture of giraffes, and stopping at Aquila’s specially built cabana for a quick stretch, I jumped out of the safari car expecting a photo opt which turned out to be a bar hosting complementary snacks and, you guessed it, more champagne! Returning back from our safari, and eating dinner just yards from the hippos, I soon realized I never wanted to leave Aquila. For the following two days, we spent our time relaxing at the pool, spotting elephants from our private porch, and riding out for a safari or two a day. Finishing up our time at Aquila with a horse back tour through the reserve, we reluctantly packed up our souvineers, checked out of our magical cabin, and hopped in our car back to the airport. While the 15 hour trek to Cape Town may be daunting, South Africa is one of the most beautiful, delicious, and unworldly places I have ever traveled to. With incredible history & infatuating culture, Cape Town is a must for any beach obsessed, elephant loving, or crazy shark swimming wanderlust & more of an experience than I could of ever dreamed it would be.